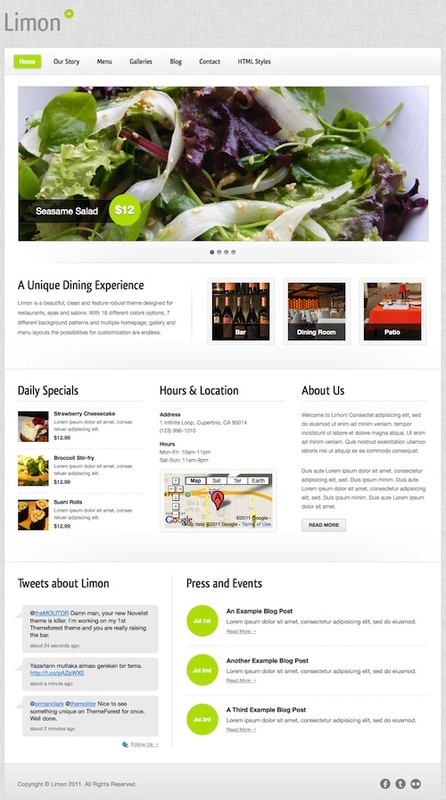 Limon is a beautiful, feature-rich WordPress theme designed for restaurants, spas and yoga studios. Limon features 18 different colors options, 7 different background patterns, unlimited sidebars and an extensive custom options panel, the possibilities for customization are endless. Also included with Limon is a custom designed Facebook Fan Page with easy setup instructions. Other features include menu card, photo gallery, google maps integrated, twitter feeds, social media icons, facebook fan page and more.